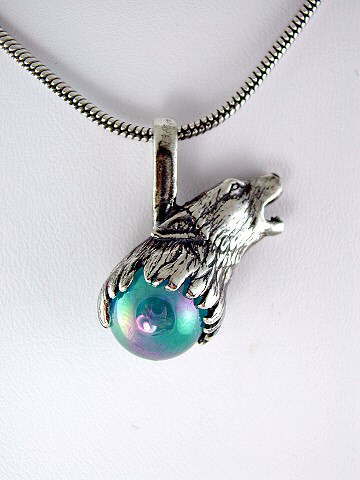 Straight from an American designer; beautiful Aqua Aura sphere, mounted in a gorgeous 925 sterling silver howling wolf design. Aqua Aura is Clear Quartz coated with a 1 micron film of pure gold, which gives it its distinctive, electric, peacock blue colour. It is an outstanding tool for people wishing to increase their psychic skills and awareness. It assists with meditation, telepathy, and psychic healing by intensifying the energy generated. It is particularly helpful for distance healing because of its ability to send energy. It is also used for protection from psychic attack. Wolves feature throughout the world in the mythology and folklore of many cultures; from Nordic to Native American Indian and Celtic. As an animal totem, wolves represent strength, freedom and family. They are powerful teachers who come to us when we need guidance and protection. They teach us balance in family matters and help us maintain our personal identity where outside pressure to change or conform exists. Wolves generally give us confidence to trust our inner voice and help develop personal spirituality. The howling wolf helps us connect to other like-minded spiritual souls as well as to our own inner voice.